Agencies work together to provide a water source for desert bighorn sheep. DESERT BIGHORN SHEEP are native to southeastern Utah. The Potash bighorn herd is one of Utah’s endemic populations, which means it is not found anywhere else in the world. That makes this herd important both historically and genetically. It is also used as a source herd to supply bighorns for reintroduction transplants and population augmentations throughout the West. The herd lives near Moab, where human disturbance and fragmentation have increased dramatically over the past 10 years. The area has been inundated by mountain bikers, ATV and four-wheel-drive vehicles and hikers. Film permits for full-length motion pictures and commercials issued by the Bureau of Land Management (BLM) have also increased substantially as well as oil and gas exploration and development. Past drought conditions have increased competition for limited forage. Desert bighorn sheep live in southeastern Utah, where they are popular with wildlife watchers and hunters alike. The Moab BLM and Utah DWR recognize approximately 330,000 acres of bighorn habitat. Recent GPS monitoring has indicated that approximately 130,000 acres are consistently utilized as ewe home ranges and ram migrational corridors. Within this area, approximately 46,000 acres (72 square miles) is utilized as lambing grounds. Management recommendations for the BLM’s Moab Field Office suggest that there should be at least one water source for every two square miles within lambing grounds. Many known ewe home ranges and lambing grounds are experiencing increased recreational use and energy development. Providing a consistent water source within these home ranges (one that is either protected by topographic features or placed away from human conflict) would help minimize impact to sheep and help stabilize the productivity of the group. In 2011, the BLM’s Utah State Office provided the Moab Field Office with funding (from the Washington Office) to construct on-the-ground wildlife projects. The Little Canyon/Gold Bar area has long been a well-used bighorn area. 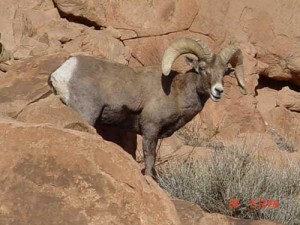 There are numerous bighorn sheep game trails and bedding grounds. The area is also protected by topographical features and is several miles from roads and human activity. It was an ideal location for the construction of a guzzler. 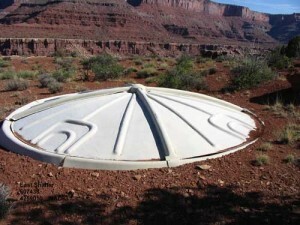 Past bighorn sheep water developments have consisted of a fiberglass saucer, valve box and cement drinker. These fiberglass structures are no longer available in today’s marketplace. Fortunately, the BLM’s Moab office had installed one of these systems twenty years earlier for antelope use. It was in a very accessible location where heavy equipment could be used. During the summer of 2010, this saucer system was removed and a Boss tank system was installed to replace the old system. The fiberglass saucer was disassembled and transported to Grand Junction, Colorado to be refurbished. Through an assistance agreement, BLM funds for guzzler maintenance and construction were transferred to the Utah Division of Wildlife Resources (DWR). The DWR used the funds to employ a qualified seasonal employee, Kevin Denney, and to pay for needed materials, equipment and contractual labor to maintain and repair existing guzzlers and install new ones as opportunities arose. In mid-June of 2011, the Moab BLM Fire Shops helicopter arrived for the fire season. As part of a training exercise, the helicopter and Helitak crew assisted the DWR and the BLM in long-lining all of the guzzler materials from the top of Long Canyon to the Little Canyon site. Now that it's completed, the Little Canyon guzzler will help bighorn sheep—and other wildlife—in this arid region. A week before the air lift, all materials were securely bundled according to weight and size specifications and loaded onto a trailer while awaiting lift. The morning of the lift, DWR guzzler tech, Kevin Denney, two BLM range personal and two Utah Conservation Corp (UCC) employees hiked into the site from a location approximately two miles above and awaited the delivery. By late morning, the Helitack crew and helicopter had arrived at the staging site and the long-line effort began. Thanks to the help of the Moab Helitack, the airlift project went smoothly, and all materials were onsite by early afternoon. Once materials were onsite, the installation work began. The crew assembled and installed the saucer, dug trenches, ran waterlines, installed the valve box and poured the cement drinker. By early that same evening, the entire system was finished and ready for rain. It was almost dark by the time the crew hiked up out of the canyon and returned to Moab. This was another exciting and ambitious project that involved a great deal of planning, organization and hard labor from our seasonal DWR employee along with the welcomed additional help from the BLM range program and the UCC employees. Not a single detail could be overlooked, due to the remote location and limited access of the site. One forgotten fitting could have meant a day of lost time and a forgotten heavy object could have stopped the project for months—or even years—waiting for a helicopter to deliver the item. Moab’s new resource management plan (RMP) now protects this area and the guzzler location, the Little Canyon site, through a No Surface Occupancy stipulation that precludes new developments. Close coordination and cooperation between the DWR, the Moab BLM and the Moab Helitack helped make this project a big success! Special thanks to the BLM Range Program and the UCC for the onsite help, and to the Utah State and Washington BLM offices for the needed funding. Thanks to you and all of the others that made this guzzler happen. Our wildlife is in good hands. I am the Habitat Chairman for our local chapter of Quail Forever. The US Forest service has an saucer or parabolic guzzler that is missing one of its quarter panels and we need to purchase one. I can not find any information here in Calif. on them. In seeing your article you show a saucer or parabolic. Can you send me any info on where I can purchase one. can you provide any information on what make your guzzler is? Where can we buy one or parts for one like yours? We had one of those saucer style fiber glass guzzlers as shown in your picture that was destroyed in a fire. I need to replace it and can’t find a manufacturer. Do you have information on a supplier?